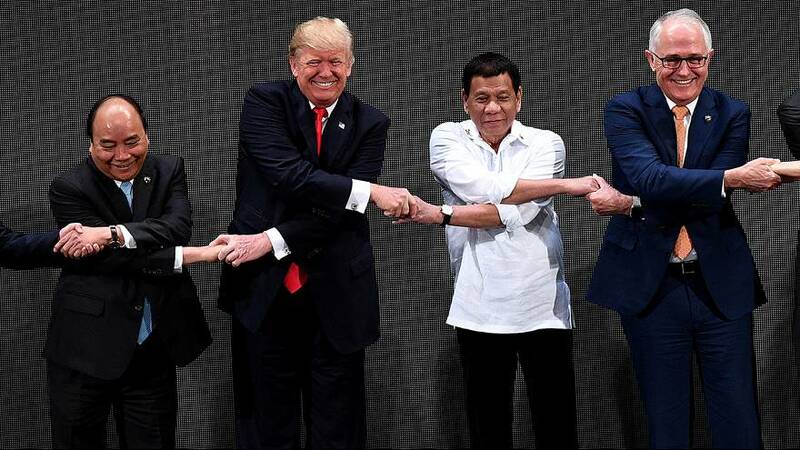 Known for his long and sometimes awkward handshakes, US President Donald Trump appeared slightly uncomfortable when performing the customary ASEAN handshake. During his visit to Manila, Philippines, Trump attended the opening ceremonies of the Association for Southeast Asian Nations. Standing centre stage, the US President was directed to join the handshake, where leaders draw their right arm over their left to shake hands with those positioned on either side. After some confusion and reaching for Vietnamese Prime Minister Nguyen Xuan Phu and Philippine President Rodrigo Duterte with the wrong hands, he corrected himself and managed to do the traditional salute. The brief disruption prompted smiles across the room, including from the US President himself who let out a wide grin after the mess-up.